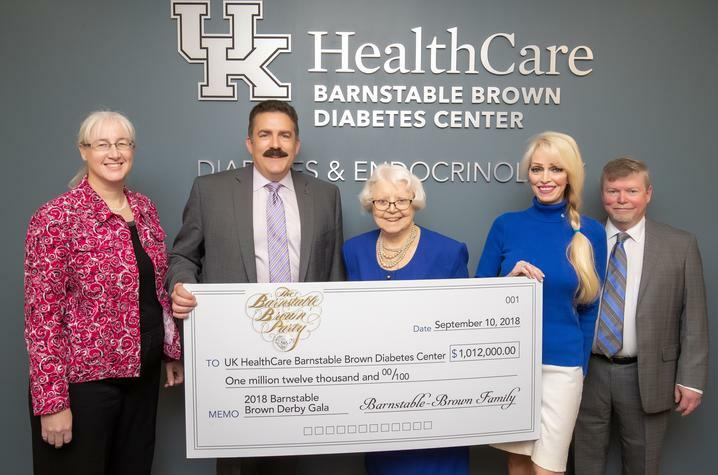 LEXINGTON, Ky. (Sept. 11, 2018) — The Barnstable Brown Gala, the premier Kentucky Derby Gala, today donated over $1 million from proceeds from its 2018 Gala to the University of Kentucky Barnstable Brown Diabetes Center. Since 2008, the Barnstable Brown family has donated more than $15 million to the center from proceeds from the annual Barnstable Brown Derby Eve Gala held in Louisville, Kentucky, including this year's 30th Gala. "Thanks to the generosity of the Barnstable Brown family, patients with diabetes in Kentucky can receive the highest level of patient care and benefit from innovative research that impacts treatment and understanding of diabetes," said Dr. Mark F. Newman, UK executive vice president for health affairs. "Due to the vision and amazing work of this family, those with diabetes, no matter what age, have access to the best in diabetes medical care, complemented with outstanding educational support." "The generous donations provided through the Barnstable Brown Derby Gala enabled us to open the expansion of the Barnstable Brown Diabetes Center in late 2017 and now, with their continued support from this year's Gala, they continue to fund our efforts in both the research and treatment of diabetes," said Dr. John Fowlkes, director of the Barnstable Brown Center. "When we started the Barnstable Brown Gala over 30 years ago, our goal was to build something lasting to help the millions of people who suffer from diabetes ̶ a disease our family has seen up close. The Barnstable Brown Diabetes Center has exceeded all of our expectations," said Tricia Barnstable Brown. "This gift is only possible because of the generosity and kindness of our many ticket buyers, sponsors and celebrity guests." The Barnstable Brown Gala is internationally recognized as the “premier” Kentucky Derby gala and counted among the “10 Best Parties in the World” by Condé Nast. The Barnstable Brown Gala is famed for its musical extravaganza and annual celebrity lineup, with past guests including Kid Rock, Tom Brady, Miranda Lambert, Brooks & Dunn, Tracy Morgan, Katie Couric, Aaron Rodgers, and Boyz II Men. The University of Kentucky Barnstable Brown Diabetes Center at Turfland provides care for patients with diabetes and related disorders across the lifespan – from infants to seniors – at one consolidated location. The Barnstable Brown Diabetes Center at Turfland houses on-site access to pharmacy and supplies, ophthalmology and optometry services, laboratory testing, ultrasound and radiology. Services offered include consultation with expert diabetes specialists; coordination of care for diabetes complications screening and management; and comprehensive patient education plans.